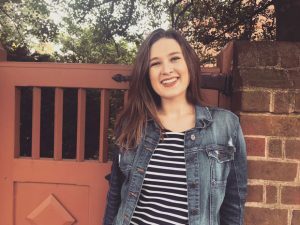 When Emma Durham learned her former elementary Catholic school principal had to move to Texas following surgery for a broken hip and wrist, she didn’t hesitate to offer to help. Durham flew to Texas with two nuns to provide assistance and helped show others how to care for the patient as she continued her recovery. She even spent three days in a convent, which she said was interesting. Durham, from Millville, New Jersey, is a senior nursing student at Notre Dame of Maryland University. She is on track to graduate in May with a Bachelor of Science in Nursing and will be eligible to take the exam to become a registered nurse. 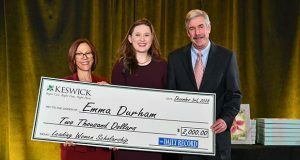 Durham was selected as The Daily Record’s Leading Women 2018 Scholarship Recipient and will receive $2,000 for educational expenses. She is the only student in the nursing program at Notre Dame who is focused on geriatrics. But she wants to work to change the view of geriatric care, especially the negative image that nursing homes often have. In the final spring semester, nursing students complete a practicum experience in an area of interest. Durham, with the help of the school, was able to secure a position on the acute care for the elderly unit at Anne Arundel Medical Center. She will complete 158 hours with the unit before graduation.